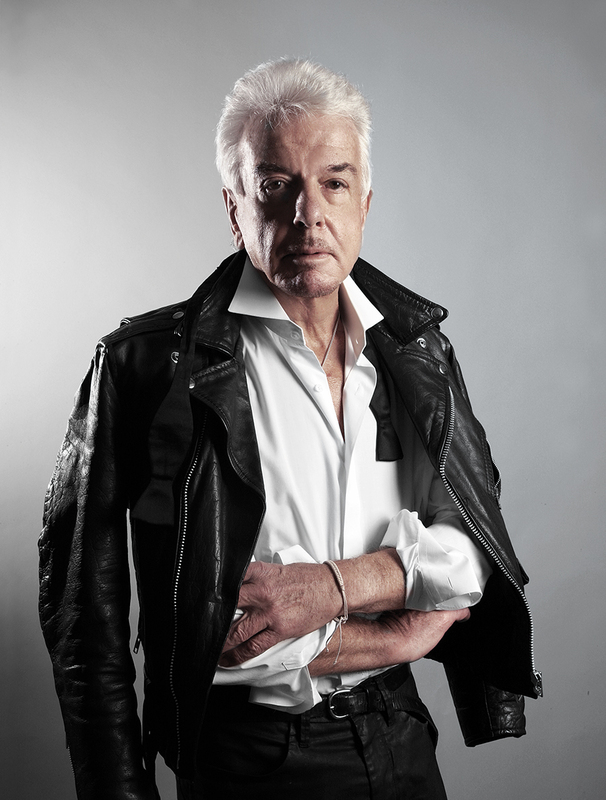 DESIGNER, SOCIALITE, COWBOY, SINGER: NICKY HASLAM HAS BEEN THERE, DONE IT AND HAND-EMBROIDERED THE T-SHIRT. THE LIVING LEGEND CHATS TO PIPPA BROOKS ABOUT HIS FORAY INTO MUSIC...WITH A LITTLE HELP FROM HIS (FAMOUS) FRIENDS. Nicky Haslam is leaning over a computer screen with our photographer as I enter the studio. They're inspecting the best portraits from this morning's shoot and have arrived at a genius shot of Haslam; elegantly hunched in a pose that is pure Dovima: leather jacket casually but just-so on his shoulder, cigarette (slim Vogues, naturally!) poised and posed inches from his mouth, smoke coiling chicly upwards, eyes in a sideways smoulder to camera. He knows what he's doing. The monochromatic outfit: Acne black leather jeans, crisp white Prada shirt and beaten up black biker jacket, topped with his very white cropped hair…looks like a nod to his Sixties mod days. When he and David Bailey led the British invasion on New York, drainpipes, white collarless shirts and Anello and Davide winkle picker boots were their bad boy uniform. Haslam slips the leather off and a bit of grey marl heavy-gauge cashmere on to get comfy, and I spend the next hour rapt - one minute cackling with mirth, the next, holding my breath as immortal names from the firmament are clanged about me with reckless abandon. I'm not complaining: his is a life lived, at the hub of society happenings, from parties of legend to scenes in the making. Known as much for the 'Sheer Opulence' of his interior design business as for doing the twist with Bailey and Shrimpton at the Factory or transforming his features to resemble Liam Gallagher in the Nineties, Haslam has socialised from Saint Tropez to the White House. He has had more than a passing acquaintance with a breathtaking role call of the greats of the 20th Century (my list of favourites include Greta Garbo, Lena Horne, Cole Porter, Andy Warhol (who credited Haslam for bringing the British look to New York), Marilyn Monroe, Cecil Beaton, Shirley MacLaine, Francis Bacon….and on and on). Rubbing shoulders effortlessly with royalty one minute, joining Dali and Gala for a séance the next, Haslam has such an openness to experience. He has a love of people and a genuine interest in them still, even though you might think he would have become jaded or reached some kind of saturation point. Haslam's outlook really has kept him young; he lived as a cowboy in Arizona at one point in his youth, "The only reason I bought a ranch was to wear cowboy clothes, let's face facts!!" Oh, and he was Joan Crawford's date for the premiere of Cleopatra and worked under Diana Vreeland at American Vogue. He's been everywhere and met pretty-much everybody! Nicky Haslam has made a record. Yes, he is making his debut as a recording artist and releasing Midnight Matinée through Cherry Red records this summer. 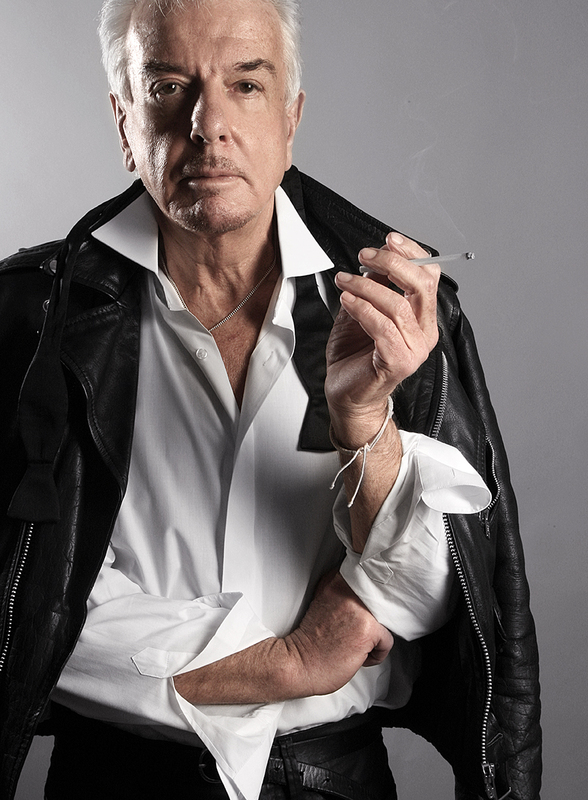 In the tradition of Noël Coward, Quentin Crisp and These Foolish Things-era Bryan Ferry, Haslam's album will have a piano-bar feel and feature spoken word performances as well as songs and will even include a couple of tracks which promise to be Disco in feel. Being Haslam, the list of collaborators is insanely impressive: Bryan Ferry is actually in there, Nicky duets with Cilla Black and Helena Bonham Carter, Rupert Everett reads from Andy Warhol's diaries, Tracey Emin reads a short story she wrote, Guy Chambers wrote a song for Haslam…and you might have heard of his backing band, Pink Floyd. I KNOW! I told you… insane! My favourite Motels track of all time is Total Control. I was thrilled to hear Haslam has covered it for Midnight Matinée. And he does a lovely job. The other track I've heard from the album is the duet with Bryan Ferry, Illusions. Originally written for Dietrich ("I've always wanted to be Marlene Dietrich!") the only other artist to have covered it is Marianne Faithful. Good choices. But then, Haslam is "word perfect in the songs from every musical from 1947 onwards", so his memory contains a dream back catalogue. Wylde: How long have you held ambitions to make a record? Nicky Haslam: I'd always sung. My sister lived in America and she used to come back with all the latest records and I always sung at parties for fun. Then I did a cabaret residency at the Savoy and Annabel's and David Ogilvy my producer heard me there and said, "you know, I could do something with your voice." With that line-up, it would be a bit of a number to go on tour wouldn't it? It's being mastered at the moment by the people who did Led Zep. Of course it is! Can you remember the first record you heard or that made an impression on you? Absolutely! It was The Isle of Capri by Nat Gonella. He had the sexiest voice. I remember it so well from when my mother used to play it in her bedroom. And The Harry Lime Theme by Anton Karas; that sums up my childhood completely. Is there a singer or a band who you constantly return to, or a record that is like a soundtrack to your life, as corny as that sounds? A singer that I come back to all the time is Lee Wiley, a chanteuse from the Thirties and Forties. Cole Porter told me about her. She's extraordinary. Is it fair to say that you were obsessed with Liam Gallagher in the Nineties, even modelling your appearance on his? Well, I was almost in love with Gallagher because he was so bad. I was at the Ritz after that period and he was there with Patsy [Kensit] and he said "What's wrong? You don't look like me any more!" Sweet. People have always said I changed my image all the time but I just tried to look up to date. To look like people in the street. Image has always been a big part of your day-to-day life. Your outfits, from the biker leathers to the self-stitched lace shirt cuffs in the Sixties were, and are, meticulously put together. How important is image to you? People have always said I changed my image all the time but I just tried to look up to date. To look like people in the street. I like to look up to date. In Arizona when I was a cowboy I had ripped clothes joined together by safety pins! In the Sixties we had our suits made in the East End and our winkle pickers came from Brixton. Who was the ultimate mod, do you think? Who wore that look well? Probably David Bailey in his boxy jackets and narrow pants. David says we invented the Sixties. We were doing the look that epitomised the Sixties in 1957. Then Liberace was important too, because before him, men didn't have sparkles. He was such a sweet man. Yes, the concept of retro wasn't really there when I was young. Unless you're talking about Bunny Rogers and his Edwardian suits. We wanted to look fresh and young and scrubbed. The biggest difference was made by Vidal Sassoon. It was revolutionary that he made people wash their hair! Before that people washed their hair once a week, or had it washed at the hairdressers. He brought in the concept of shiny, clean hair which was quite new! You were art director at a very young age of Show magazine in the Sixties after working on Vogue, doing layouts for Diana Vreeland. You also worked on Ritz magazine in London in the Seventies, which we love here at Wylde. How did you enjoy the magazine world? I was so lucky to work daily with Vreeland, and the education that entailed. In Show we did the first piece on underground movies. Show was like Vanity Fair before it existed; the arts, social things….we had Baby Jane Holzer on the cover, sucking the American flag; people were cancelling their subscriptions in horror! I did layouts, photography and then interviews (memorably with Stephen Tennant) and a gossip column for Ritz, it was great fun. You commissioned Diane Arbus at Show didn't you? One of my favourites… how was working with her? I knew April Ashley when she was Tony April, singing Get Me To The Church On Time in Paris cabaret. She's so dignified now, isn't she? Makes The Queen look like a chorus girl! Sitting here in the offices of Wylde just off Old Street, you must be quite struck by the changes to the East End? You never dared come here, now it's buzzing, really exciting. I used to come with David Bailey sometimes. We used to go to the first drag cabarets at the Duraggon pub. All these straight boys being Marlene Dietrich and Rita Hayworth, with their mothers sitting in the front row. I'm slightly bored of drag queens. Drag's become quite déclassé in a way, androgyny is better I think, wonderful. I knew April Ashley when she was Tony April, singing Get Me To The Church On Time in Paris cabaret. She's so dignified now, isn't she? Makes The Queen look like a chorus girl! I wonder how having polio when you were very young, which immobilised you in a full body cast and rendered you bed-bound for two years contributed to your love of interiors? I can't imagine how a little boy coped with staying still for such an interminably long time but with only the walls and ceiling to look at, you must have been intimate with every inch, every corner and cornice of your room? It was boring but quite wonderful, in a way, with people coming to read to me and things. I was quite spoilt really and I only saw grown-ups at that time and so I had a very sophisticated point of view. I didn't think 'oh I'm not running around playing games', I just thought 'oh I'm lying here doing other things' it's part of acceptance of life in a way. When I eventually did go to school I couldn't bear all these ghastly things farting and playing games and I thought, why can't they talk to me about Greta Garbo like my parents did?! The interiors happened much later after doing layouts and I didn't get my first proper interior design jobs until the early Seventies. I think I'm the opposite of vain. Vain people think they're perfect. I don't think I'm perfect; that's why I've had face-lifts. I'm intensely interested by interior spaces and how one can make them look more wonderful. I always say, the only point of decoration is to make people look prettier and make them feel happier. So that's what I like doing: making people feel wonderful. My favourite kind of person is the 'slash person' (© Dianne Brill). You fall into that category; refusing to be pinned down and being unafraid to try something new, this record being a case in point. Is there anything you still wish you could have done, or been? I like to be unboxed. As far as things I wish I had done…creating sets for Hollywood musicals would have been heaven. I love that scene in the Ziegfeld Follies with the set like a Dali painting [clutching his heart at the thought]. But everything I do is inspired by interiors, in a way. Even the singing is part of what happens in a room, the atmosphere. And off Haslam goes into the East End traffic, leaving me in a puff of smoke with the image of hundreds of Ziegfeld girls perfectly posed in Technicolor decorating my mind for the rest of the day…. [Laughing] Waking up every day! I think life is thrilling, for me it just seems to get better. I love the past and talking about it, but I don't hanker for it. I love modern life. I think I'm the opposite of vain. Vain people think they're perfect. I don't think I'm perfect, that's why I've had face-lifts. If I had to choose one it would have to be Velasquez. What's your favourite recreational drug? [Slight gasp!] I suppose cigarettes. And it helps with my voice. You know all opera singers smoke like fiends! A proper gin martini. Or a Gibson even better, I was taught a proper Gibson by Noël Coward. It's so embarrassing... I absolutely adore cheese slices! With white bread! Nothing like it! What is your pet-hate when it comes to interiors? Dead plants. They look so horrible. The Queen's party after Diana's wedding. What's the epitome of chic? I think insecurity is quite chic. The opposite is smugness, that's the worst. Who is or was the love of your life? A new love, an architect from New York. To live in, it has to be London. Street life in London is the best in the world. If I couldn't live in London I'd probably live in Rome, but you'd probably go bananas with the provinciality. Or Istanbul, it's magic. Who do you consider The Great Beauty? It occurred to me the other day that female beauty is all that matters; from Helen of Troy onwards... Dietrich, Hedy Lamarr, Dolores Del Rio, Ava Gardner. [Wylde: Cyd Charisse?] Ah, Cyd Charisse! I met her in Hollywood with Cecil Beaton, we went to dinner at her house. Lovely woman. Is there anyone left you haven't met that you'd love to? Sandi Toksvig. [I am visibly, thrillingly shocked!]. I just think she's so funny.